The international community has been warned that its failure to act on state-sponsored violence in Zimbabwe is encouraging other African regimes to crack down on opponents. The warning came from Zambia’s opposition leader, Hakainde Hichilema, who has accused the country’s president, Edgar Lungu, of trying to kill him. He said police and activists from the ruling Patriotic Front opened fire on a rally he was holding in Sesheke in south west Zambia. 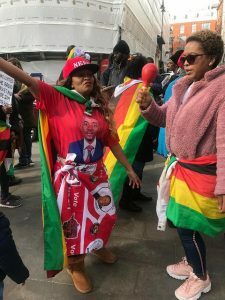 Hichilema said Zambia was going the same way as Zimbabwe, where reports say at least 17 people have been killed and many others injured, tortured or raped by security forces suppressing protests over rising fuel costs. More than a thousand people are said to have been detained. ‘You see what happened in Zimbabwe and no one did anything . . . so it is creating a ripple effect,’ Hichilema said (see: http://www.zimvigil.co.uk/vigil-news/campaign-news/998-zambias-president-edgar-lungu-tries-to-kill-hakainde-hichilema). In a new briefing ‘Open for business, closed for dissent’, the human rights organization Amnesty called on the international community to take an unequivocal stand and publicly condemn the human rights violations in Zimbabwe (see: https://www.amnesty.org.uk/press-releases/zimbabwe-most-brutal-tactics-imaginable-used-authorities-crush-fuel-hike-protests). The African Union is holding its annual meeting but, while Zimbabwe and other African countries such as Sudan are in ferment, it is devoting the meeting to discussing migration. This is no doubt an important question and it will please President Mnangagwa who has taken the time off to go and hobnob in Addis Ababa, leaving his rampaging soldiers to beat the people into submission. The fact that his Zanu PF party has caused millions of Zimbabweans to flee the country will probably not be mentioned. The most troubling message came from the UK-based academic Professor Stephen Chan, who closely follows Zimbabwean affairs. He told a meeting of the UK parliamentary committee on international development that the army’s brutality was intended to deter any future protests. People were ‘left with wounds to tell a tale to relatives, friends etc’ (see: https://www.newsday.co.zw/2019/02/zim-security-forces-are-divided-uk/). A senior official of Action for Southern Africa, the successor organisation to the Anti-Apartheid Movement, Sunit Bagree, has called on the West to demand an international investigation into the Zimbabwean human rights violations (see: https://www.dailynews.co.zw/articles/2019/02/07/west-must-up-game-on-human-rights). At the Vigil flowers were placed against the wall of the Embassy in tribute to the victims of the security force rampage. Thanks to those who came early to help set up the table and put up the banners: Enniah Dube, Gertrude Makosvo, Patricia Masamba, Bianca Mpawaenda, Margaret Munenge, Esther Munyira, Fungisai Mupandira, Tapiwa Muskwe, Casper Nyamakura and Ephraim Tapa. Thanks to Bianca, Margaret and Esther for looking after the front table, to Thomas Mahosah, Katie Truslove and Bigboy Sibanda for handing out flyers and to Casper, Gertrude, Fungisai Mupandira, Daizy Fabian, Patricia Masamba and Joyce Mbairatsunga for photographs. FOR THE RECORD: 33 signed the register. ROHR general members’ meeting. Saturday 2nd March from 11 am. Venue: Royal Festival Hall. Contact: Ephraim Tapa 07940793090, Patricia Masamba 07708116625.